Social Thinking methodology teaches individuals with social learning challenges to think about the social world, in order to communicate more effectively. It provides practical frameworks and strategies to help interpret and respond to abstract social information. It is relevant to individuals with autism and/or ADHD, whose academic performance is in the normal range but who face significant challenges in social understanding. Building on Social Thinking methodology, this is a new workshop in which Michelle Winner explores the muddy waters of feelings and emotions, both intrapersonal and interpersonal. 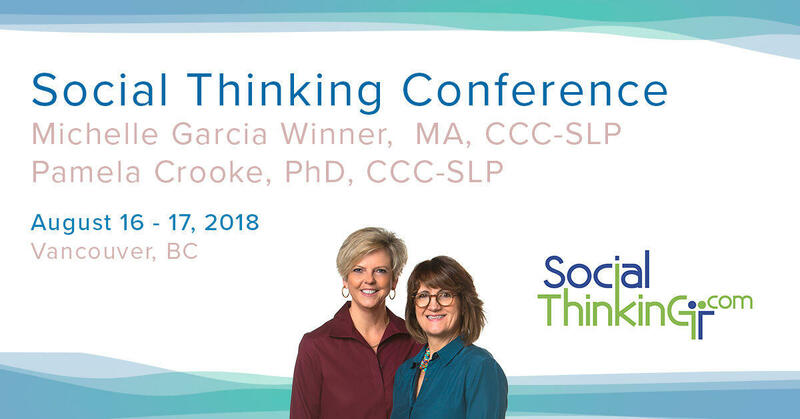 Newly explored concepts, frameworks and strategies will be shared for use with individuals with social-learning challenges, and the professionals and families who support them. As the attendee makes sense of this information, it will also help them make sense of themselves! This day focuses on teaching to fidelity the strategies of core Social Thinking curricula You Are a Social Detective! and Superflex. These provide developmentally appropriate tools to foster social attention and self-regulation for students in kindergarten through middle school. This is an interactive day filled with creative group activities to help our students move from being “Me” thinkers to “We” thinkers. The connection between these lessons and educational/academic standards in the mainstream classroom will be examined to see how they can help improve reading comprehension, written expression, conflict resolution, and working as part of a group. This entry was posted on August 16, 2018 by Stephanie Porter.